If you're reading this article, then chances are that you're looking for a new pet bird. Venturing into the wonderful world of bird ownership can be very fun and exciting, but it's important to understand that not all birds are created equal -- and it all starts with the breeder. Choosing a good breeder is about more than getting the best price. It's about buying from someone who has a genuine love for their birds; a love that is evident in the way that they are raised and cared for. Read on for helpful information that will lead you through the process of finding a qualified and reputable bird breeder to work with. Locating a bird breeder is not usually hard to do -- it's locating a good breeder that can be a task. Nevertheless, you have to start somewhere, and your local newspaper's classified section is as good a place as any. Skim the ads for birds for sale, and respond to the ones that look promising. You may be surprised to find out how many bird breeders are active in your area. Another good resource for finding reputable breeders is to look online. There are several free breeder directories on the web that can help put you in touch with local breeders at the click of a mouse. Exotic bird clubs and aviculture societies can also be a great way to find good quality breeders. Try checking the online directory maintained by Petstation for contact information for the organizations that are near you. Most bird clubs and societies are comprised of bird owners and breeders that are extremely passionate about their feathered friends. They can be a great resource to you as a new bird owner and will be eager to help you along every step of the way. Once you've located a breeder in your area, you will need to meet with them. In this meeting, you can gather crucial information about the breeder's husbandry and breeding practices, as well as insight into how your potential pet was raised. Ask the breeder how long they've been breeding, and how long they've been working with the species that you are interested in. Any breeder will possess some knowledge of their available birds, but a good breeder will have the experience to back it up. Raising healthy and tame baby birds is a full-time job, so responsible breeders will show an appropriate level of pride and enthusiasm for the birds that they produce. As you chat with the breeder, you'll be able to tell if you are dealing with someone that has a genuine passion for aviculture, or someone that is looking to make a quick buck from a few unlucky parrots. Once you've established that you are dealing with someone who is knowledgeable and sincere, you can consider meeting the birds that are available for sale. When you are thinking of buying a bird, it's always good to see the facilities in which the bird was raised. However, this may or may not be possible, depending on the breeder. Some breeders operate closed aviaries, which are maintained in a clean, disease-free state for the health of the flock. These aviaries are operated under strict guidelines that minimize the risk of introducing disease to the flock, and the owners do not often allow tours. Do not be offended if you come into contact with a breeder that operates this type of aviary -- these breeders are often among the best to buy from. 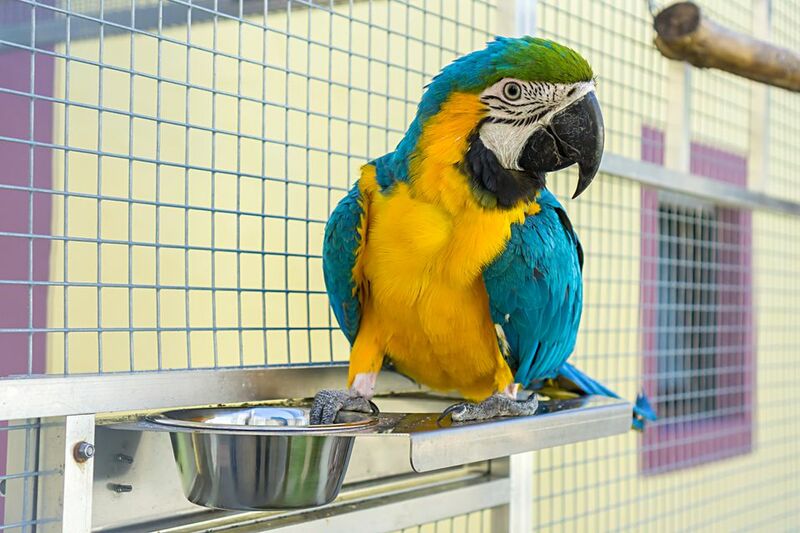 Most offer health guarantees on their birds, and will work with you to make sure that you get a well adjusted pet that has been raised in a healthy, clean, and happy environment. Cages should be clean. Dirty cages are an automatic red flag when looking for a quality bird breeder. A good breeder will always strive to maintain the highest standards of cleanliness in their birds' environment, not only to reduce the risk of disease, but to make sure that the birds are happy and comfortable. Food should be fresh and varied. Good bird breeders don't just feed their birds seeds and pellets. When you go to see the birds that your breeder has available, take a peek into their dishes and see what they're eating. In addition to a seed or pellet mix, the birds should be offered a variety of fresh fruits and vegetables. Birds should be healthy and sociable. Birds that come from a good breeder will be eager to interact with you. They should be alert and active, and should exhibit all the signs of a healthy bird, such as bright eyes, clean feathers, and full crops. After you've taken your new bird home, the breeder should make him or herself available to answer any questions that you might have. Remember, this person has been with your bird since the very beginning, and has played a significant role in his growth and development. They will likely want to remain in touch with you so that they can offer advice and insight, and so they can see how their "baby" is doing. You should welcome this sort of relationship with your breeder and take advantage of his or her wisdom. In doing so, you will be making sure that you are providing your pet with the best possible quality of life -- and that's what bird ownership is all about.